Our painters in Spartanburg, Greenville, and Simpsonville, South Carolina have been proudly painting the entire upstate for over 20 years. We provide high quality workmanship and materials to the residential painting industry in Boiling Springs and Inman, SC year round. We meet and exceed each of our customer's unique needs by adding our own personal touch. We are skilled to handle all aspects of interior and exterior painting projects. We offer 1st class house painting in Spartanburg. We offer our painting expertise and our services at market-competitive prices. We can do most small jobs in 1 day and still provide a high quality job. Spartanburg Interior House Painters: Our Spartanburg and Greenville interior painters will usually ask the customers to remove any pictures, etc. from the walls, and we can move your furniture for you. 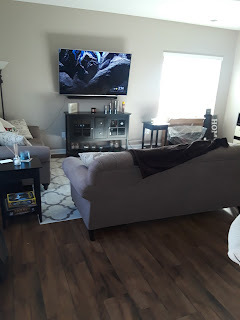 We will cover any furniture, floors, etc. with drop cloths. We make any repairs to walls, ceilings, trim that are necessary before painting. We paint the ceilings first, then the walls, and finally the trim. Our interior residential house painters in Spartanburg and Greenville, SC specialize in painting 2 story foyers. Let us do the hard and dangerous work for you. Spartanburg and Greenville Exterior House Painting: We will wash your house before any exterior painting job begins. We cover all bushes and other areas needed to prevent damage. We caulk all cracks where water can penetrate. We scrape, sand and spot prime all peeling areas and raw wood. Then after all necessary prep work is done, we begin the actual painting. Our exterior painters in Spartanburg, SC can paint your 1 or 2 story house. Let us do the hard and dangerous work for you. Our house painters in Spartanburg are the best choice for residential painting. Affordable Painting Contractors uses many different brands of paint like Sherwin Williams, Lowes, Valspar, and many others depending on the customers request. We paint with latex, which comes in a flat, eggshell, or satin finish paint or we can use oil base paint. Our local house painters can you help you decide which product to use for your home or business in Spartanburg or Boiling Springs, SC. If you are looking for house painters that are near to Spartanburg you have come to the right place! Our customers say our local house painters are reliable, affordable, neat, and have an eye for detail. The prep work is essential to any long lasting, professional job. If you are looking to do some home improvements we can help. We are experts at matching colors and can help you choose colors that will brighten and accent your home in Inman, SC. We recommend using an eggshell finish for walls, a semi-gloss finish for trim, and a flat paint for your ceilings. The eggshell finish will give your rooms a warm glow and will allow you wipe down your walls. The semi-gloss finish will add a little bit of shine to your trim to make it stand out from your walls. We use flat paint on the ceilings to prevent light from reflecting off the ceiling and keep your attention on walls and also to disguise most imperfections. We are committed to giving 100% total customer satisfaction. Our Spartanburg painters are well known and receive a majority of our jobs through word-of-mouth referrals. You can count on our house painters in Boiling Springs, Inman, Greer, or Simpsonville, SC for superior service. We can be found on google business, facebook, and thumbtack, these are just a few of the social media sites we are listed on.